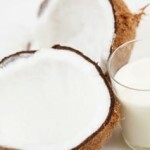 Coconut milk is obtained from the thick, white flesh or meat found inside a ripe coconut. There are two types, thick and thin milk. The thick coconut milk is obtained by squeezing the grated coconut only once, while for getting thin coconut milk, the squeezed coconut meat is re-soaked in warm water and then again squeezed for the second or the third time. Coconut milk, especially organanic is highly nutritious, and can have several benefits for human health. Coconut milk is immensely rich in vitamins and minerals. It contains high levels of some of the crucial minerals like, iron, calcium, potassium, magnesium and zinc. It also contains a significant amount of vitamin C and E. One cup of coconut milk (about 240 gm) contains 13 gm carbohydrates, 5 gm fiber, 5 gm protein and 57 gm fats, mainly saturated fats. One cup of coconut milk can provide about 552 calories, which means that coconut milk is high in calories and hence, should be consumed in small amounts. The fat content of coconut milk is also very high, which too highlights the importance of taking it only in small amounts. 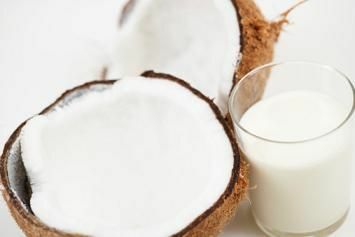 is that it contains a very high level of saturated fats, but the saturated fats found in coconut milk are mainly short and medium chain fatty acids, which are usually not stored by the body as fats. Instead, such short and medium chain fatty acids have been found to provide instant energy to the body. A major part of the fats found in coconut milk is lauric acid, which has been found to exhibit antibacterial, anti-fungal and antiviral properties. This fatty acid can boost the immune system and its disease fighting ability. Coconut milk also contains several antioidant compounds, which can provide protection against damage to body cells and tissues. improve the health of the digestive system and promote digestion. It can relieve the symptoms of stomach ulcers and acid reflux disease as well. may help to relax the nerves and the muscles, control blood sugar level, lower blood pressure and reduce joint inflammation. I buy the thick, full fat can and dilute with 1/2 to 3/4 can of water and store in refrig. i make my oatmeal with water now and add 1/4 c of diluted coconut milk with blueberries and cinnomon for nutrition and taste.